A new bill has been introduced by four House Republicans looking to finally clean up all the troubles with amnesty and border security while making sure that President Trump is more than happy to sign the bill into the law of the land. The Securing America’s Future Act was introduced by Reps. Bob Goodlatte, Raul Labrador, Michael McCaul and Martha McSally. The major sweeping changes include the end of chain migration, lottery visas and comes with a mandate that all employers must use electronic verification to ensure that their employees are legal. In exchange, the bill would give a one-time indulgence to DACA recipients, allowing them a three year renewable visa granting work permits, which will put them on the road to citizenship if they can prove that they are valuable members of society. Since turning his sights on DACA in September after campaigning on border security, Trump has been pushing the Republicans to present a plan that would get rid of the really contentious immigration issues such as chain migration, where an anchor baby can grow up to bring their family over to apply for citizenship, and for lottery visas which Trump has implied that other countries exploit as a way to get rid of their worst people. Other highlights in the bill are to reduce the overall levels of legal immigrants by 25%, translating to approximately 260,000 fewer new immigrants every year. There will also be changes to the guest worker program that will sure to set the Democrats in California howling, and ICE agents will be empowered to sent more of their agents overseas to vet prospective immigrants and visa applicants. As well, the Department of Homeland Security will have the power to detain dangerous illegals even if they are unable to deport them, and will aim to tighten up standards for granting asylum to “root out frivolous claims” and will cancel applications if the seeker returns to their homeland voluntarily. Of course, this is all so Trump can get his biggest agenda through: More infrastructure to secure the borders, and to add 5,000 new agents just for Border Patrol. 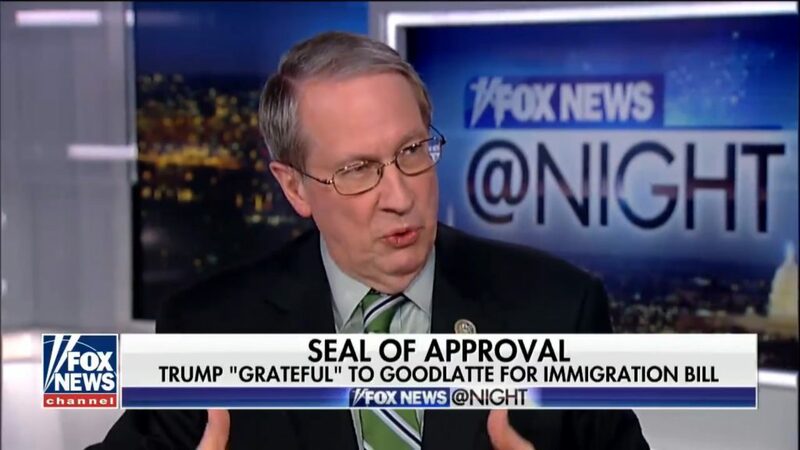 Two months ago Rep. Bob Goodlatte from Virginia posted an announcement saying that he intended to retire after serving 25 years. He has also been heavily involved with the Clinton investigation and had been appearing with Rep. Trey Gowdy in the media to talk about the Russian investigation.